Mass spectrometry (MS) can be used as a synthetic method. Undergraduate laboratories teach traditional means of organic synthesis followed by chemical and spectroscopic analysis to impart an understanding of chemical reactivity. Mass spectrometry is well known for chemical analysis with high selectivity and sensitivity. In some undergraduate organic labs, MS has been introduced but only in its traditional role as an analytical method. Recent findings from Professor Cooks’ group show chemical synthesis can be performed in charged microdroplets by spraying reaction mixtures. Performing chemical reactions in charged microdroplets provides significant rate enhancements partly because of le Chatelier’s Principle; reagent concentrations and pH are pushed to extremes as the charged microdroplets desolvate. Reaction acceleration has been observed when ionization is done by electrospray or paper spray. This provides a simple and easy platform to access chemical reactivity. 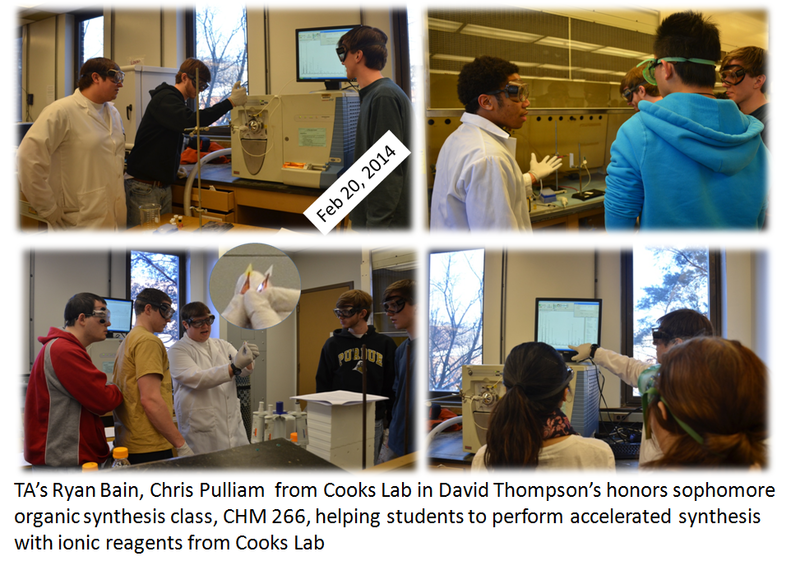 Chemistry 266 students this spring were the first to utilize this new synthetic method in an undergraduate organic lab. The students were exposed to mass spectrometry both as a means of chemical synthesis and for analysis. The method used, paper spray, is very rapid and can be coupled both with on-line analysis (by MS) or with off-line analysis (by traditional thin layer chromatography). In these experiments students examined substituent effects on a Claisen-Schmidt base-catalyzed condensation. From mass spectral data obtained during the laboratory session students were able to model electronic effects of substituents on reaction rates. The paper spray ionization source takes advantage of the enhanced reaction rates (msecond time scale) in charged microdroplets as opposed to an hour in a flask.